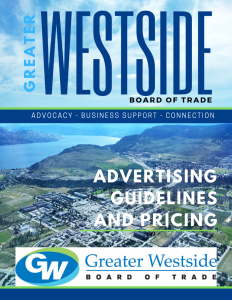 Please refer to the Greater Westside Board of Trade advertising policy below which outlines our standards and guidelines on acceptable advertising appearing on our advertising channels. As the Voice of Business on the Greater Westside the Greater Westside Board of Trade brings an informed understanding of the markets we serve and provides advertisers with a commitment to quality service. All ads are placed on a first come first serve basis. 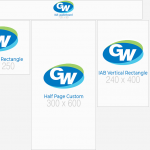 All advertising material is subject to review and approval by the Greater Westside Board of Trade marketing department prior to publication on our advertising channels. We reserve the right to not accept advertising if, in our opinion, the advertising does not meet our standards of acceptance. The views and opinions expressed in advertisements on our advertising channels do not necessarily reflect the views and opinions of the Greater Westside Board of Trade. or representations, either direct or implied, with regard to any identified or identifiable product(s) or service(s). (b) Advertisements must not omit relevant information in a manner that, in the result, is deceptive. message and should be located and presented in such a manner as to be clearly legible and/or audible. (e) The advertiser must be clearly identified in an advocacy advertisement. Advertising is not exclusive to one individual within a particular sector or industry. For example: There are no limitations to the amount of law firms or insurance companies that choose to advertise. companies or entities, or exaggerate the nature or importance of competitive differences. information about or experience with the product or service being advertised, and must not otherwise be deceptive. Advertisements must not distort the true meaning of statements made by professionals or scientific authorities. depicting situations that might reasonably be interpreted as encouraging unsafe or dangerous practices, or acts. It is recognized that advertisements may be distasteful without necessarily conflicting with the provisions of this Clause and the fact that a particular product or service may be offensive to some people is not sufficient grounds for objecting to an advertisement for that product or service. advance by the Board’s Executive Committee.